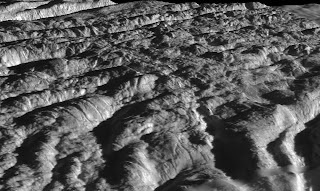 When we think of Saturn, its tiny icy moon Enceladus is right there on the list of fun stuff. The south polar region is where the current action is, so naturally I am curious about its topography. 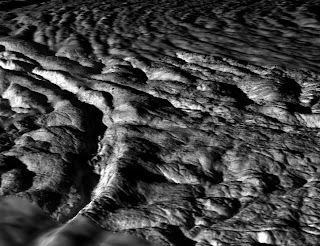 The August 2008 Cassini pass produced a set of high resolution images with resolutions from 12 to 30 meters, and synoptic coverage at 50 to 200 meters resolution. Using my magic topo maker TOPO, I have produced the first high resolution map of this terrain based on this image set. A more complete map is in progress, but it will improve this one only by degrees. 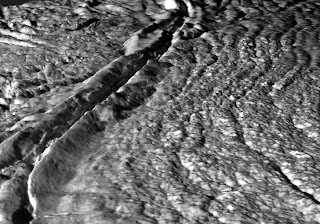 Like Europa and Triton, relief is not very high, rarely exceeding a few hundred meters locally (the story on Europa is much more complex, but that is a future blog). For now I present these fun images and movies of three of the "tiger stripe" tectonic ridges that scar this terrain. Please advise me when any of these are used! I like to keep track of where this stuff ends up. This double ridge is a site for one of the source jets for the south polar plumes. The ridges are 100 to 150 meters high, and the medial trough is 200 to 250 meters deep. The small elongate blocks at the base of the trough formed when blocks slid off the wall scarps or were thrust up from the interior along the central fault. 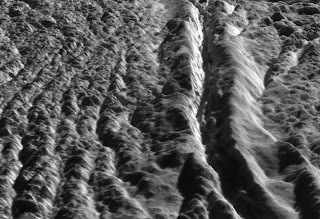 The numerous parallel ridges within the plains formed by crumpling of the icy surface. These smaller ridges stand tens of meters high. This view shows a deformed area between two branches of this tiger strip. These ridges stand is 80 to 100 meters high. Like Damascus Sulcu, numerous small elongate blocks have formed at the base of the medial troughs, which are 200 to 250 meters deep. The second view below shows an area extending into the ridged plains. The ridges of Cairo stand 150 to 200 meters high. This view shows the steep wall scarp of the medial trough that splits the feature into two ridges. Vertical striations and large boulders 10s of meters can be seen. 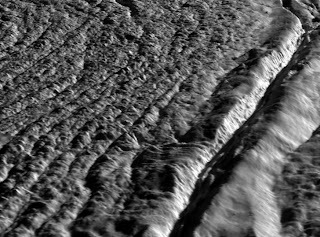 The rolling fractured ridges in the foreground most likely formed due to buckling of the icy surface. 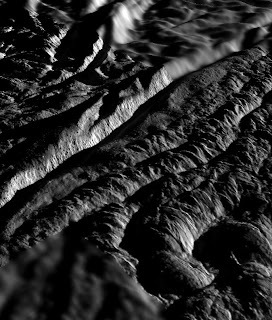 The largest of these ridges are nearly 50 meters high. Paul -- Wonderful stuff! I enjoy this greatly. 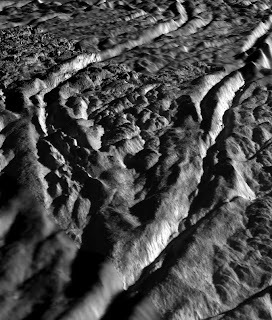 If I may make a request, for something quite a bit humbler than the animations, I'd like to see a mere comparison between altimetric cross-sections of Enceladus's tiger stripes, on the one hand, and Europa's triple ridges, on the other. I know that the scales are comparable (Europa's being a bit deeper), but it would be pretty vivid to have those side-by-side. And of course profiles from other places, ranging from Ganymede to San Francisco, would also be fun. If I may pile on while making a free request!